Britain's sailors, rowers and cyclists won four more gold medals on Sunday to match the team's Saturday surge and reach third in the Olympic medal table. 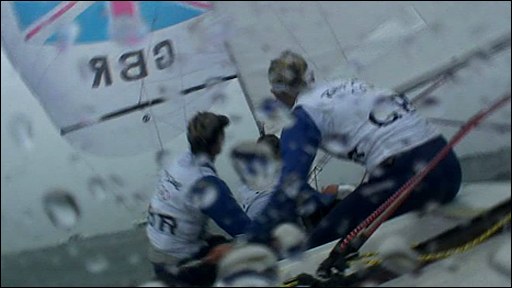 There were sailing golds for Yngling trio Sarah Ayton, Sarah Webb and Pippa Wilson, and Ben Ainslie in the Finn. 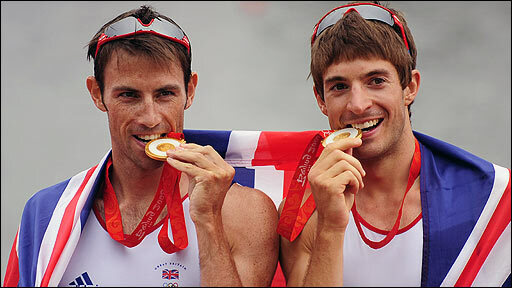 Zac Purchase and Mark Hunter took GB's first lightweight rowing gold, and Rebecca Romero won cycling's pursuit. Fellow cyclist Wendy Houvenaghel and two rowing crews claimed silver medals, while gymnast Louis Smith won bronze. One leading sporting figure called it the greatest weekend in British Olympic history. After four golds on both Saturday and Sunday, Team GB's total of 11 golds for the Games moved them above Australia and Germany in the medal table. It meant British Olympians had won 25 medals in all, including six silver and eight bronze. With seven days of action still remaining, Team GB have already matched their gold medal tally from Sydney in 2000, where they won 28 medals overall, and exceeded the nine golds from the last Games in Athens, where they finished with an overall haul of 30. Britain have not claimed more than 11 golds in an Olympics since 1920. If they earn 16 golds or more by the end of the Games, it will mark their best performance in a century. Prime Minister Gordon Brown hailed the "unprecedented" success of Britain's athletes in a statement released by Downing Street. "Eight gold medals and 17 medals in total in one weekend is a superb and unprecedented achievement," said Brown in the statement. "The whole country has been watching and has been thrilled by Team GB. We are immensely proud of what they have achieved so far, and inspired by their performance." Lord Moynihan, chairman of the British Olympic Association, paid tribute to "the greatest weekend in British Olympic history", highlighting results in key sports. "We haven't delivered at this level of consistency across some of the sports which I would call the formula one sports for many, many generations," he told BBC World News. Queen Elizabeth II has invited Britain's Olympians to a drinks reception at Buckingham Palace after the Games. A royal spokeswoman said the monarch had been taking "a keen interest" in the Games, and will host a reception for members of the squad on 16 October. Ayton, Webb and Wilson, in sailing's Yngling class, earned Britain's opening gold medal on Sunday. The crew battled home in first place in their medal race, well ahead of their Dutch rivals, to seal gold. "Winning an Olympic gold medal, you're the best at what you do in the world," said skipper Ayton. "You just can't describe what Sarah and I have been through for the last four years and with Pippa for the last two." Lightweight double sculls duo Purchase and Hunter added gold number two at the rowing, earning Britain's first ever lightweight gold medal by a comfortable distance over Greece. "It's unbelievable," a breathless Purchase told BBC Sport. "We sat down back in October and said we wanted to come here and win this. "We knew Greece would come back, we had to have a solid middle 1000m to make sure we crossed the line first, and then it was a case of holding on and keeping going." 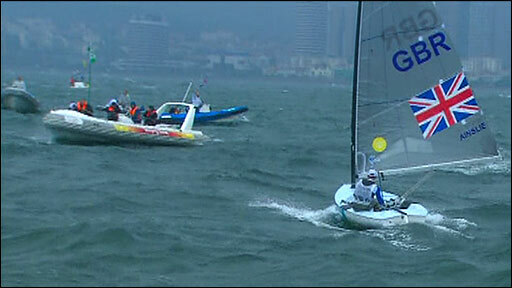 Ainslie claimed Britain's third gold of the day back in Qingdao, keeping US rival Zach Railey at bay to claim the third Olympic gold of his sailing career. "Yesterday the breeze was very light and I couldn't give the American guy any chance to get away from me," said Ainslie afterwards. "Today I was more confident with my speed against his, and my fitness," he added, having crossed the line first in his medal race. 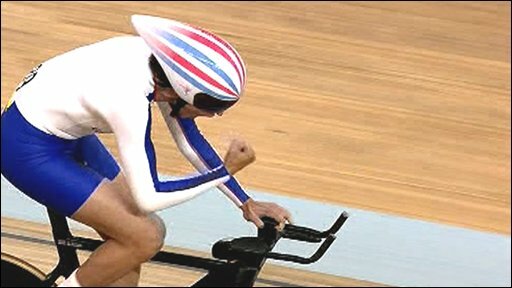 Romero picked up gold number four in an all-British women's individual pursuit final at the Laoshan Velodrome, which guaranteed Britain both gold and silver. The former Olympic rowing silver medallist, who swapped sports following Athens 2004, eased past Houvenaghel, who took silver. "It's magical," an elated Romero told BBC Sport. "It's been so hard, I can't explain what I've had to go through. "I totally believe myself now. I did before, but that was the ultimate. I was facing the demons, I was up against tough opposition, and a week ago it wasn't in me at all." Britain have now won a total of 10 cycling medals, two on the road and eight on the track, with Bradley Wiggins and Chris Hoy both striking gold on Saturday. The women's quad and men's eight added two silver medals to the rowing tally on Sunday, meaning Britain finished the Olympic regatta with two golds, two silvers and two bronze, bettering their conservative target of four medals of any colour. Gymnast Smith rounded off the weekend with a superb performance in the pommel horse to claim bronze for Britain. It was Britain's first gymnastics medal at the Olympics for 80 years. Meanwhile, Team GB chief Simon Clegg insists that while the medal haul has been very impressive so far, there remains another week of competition and focus. "It has been a fantastic week for us - we're all very proud of the team's achievement," Clegg told BBC Sport. "However, we have another seven days of competition and we want to deliver the same level of service and support. "We don't want any complacency and right now there's not much time for celebration." Further cycling medals are expected and there are hopes of an athletics gold. Christine Ohuruogu was second quickest in qualifying for Tuesday's women's 400m final while Phillips Idowu is favourite for the men's triple jump on Thursday. "The atmosphere in Team GB is awesome," Clegg said. "Everyone is walking tall, walking proud and everyone is feeling that they can step up to the plate."